24 people, including 10 children, were lured from Krishnagiri in TN with promises of a better life; their ‘owners’ let them off recently fearing an inspection. When 27-year-old Muthuraj visited his native Nedusalai village in Veppanapalli block in Krishnagiri for Pongal, there was no question of escaping the life of bonded labour that he had temporarily left behind in Karnataka’s Sakleshpur. His family and friends were still stuck in a brick kiln, 300 km away, and while he was determined to rescue everyone, the only way he could think of was to return there. However, before Muthuraj and the 23 others from Nedusalai could think of ways to escape, the owners of the brick kiln put them in a van and dropped them off in Krishnagiri. They got word that the Tehsildar of the district was planning to inspect the kiln, and before the officials could arrive, the owners decided to wrap up the workers and send them back home. They were also forced to sign papers that claimed they were treated well by the owners of the kiln, the workers said. Around six months ago, two men called Raju and Murali lured five families from Nedusalai village to Sakleshpur. They were promised timely and nutritious food, money and decent accomodation. “They told us that we will be working in a humane environment with proper food and shelter. 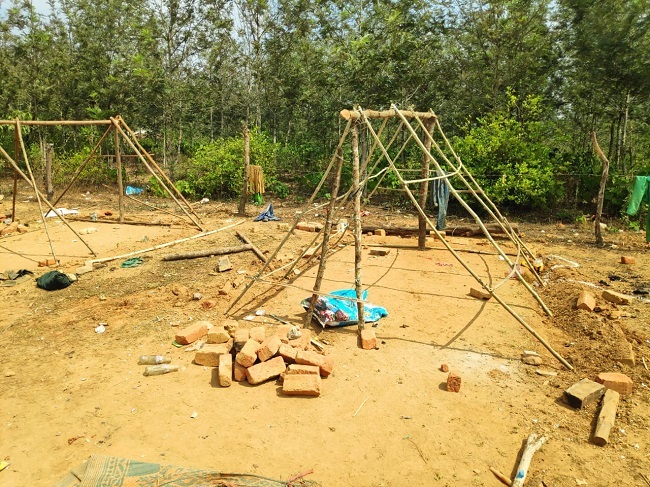 They also told us that we would be able to send the children to school,” Muthuraj tells TNM. What awaited them in Sakleshpur, though, was hell. The workers were made to stay in a bamboo hut, with a tarpaulin sheet for roof. “We were given Rs 1,000 per family per week, and allowed one trip a week to the local grocery store to buy supplies,” Muthuraj says. “Even this money was given only if Sachin or Manju gave the green signal to Raju or Murali,” he adds. One of the worst things that the workers had to undergo during their six months in the kiln was the constant monitoring by their ‘owners’. Though one member from the group was permitted to go to the local market to buy groceries for the upcoming week, it came with its own rider. Apart from the continuous stalking by the henchmen of the brick kiln owners, the group was not allowed to visit their village. In the first week of January, Muthuraj’s cousin died in Nedusalai and he had requested permission to go and visit his family, which the owners initially refused. He finally managed to get permission to go home alone. “Around the same time, a three-year-old boy who was working in the kiln was bit by a stray dog. We requested the owners to help us take the boy to a hospital and get treatment, but they refused. Later after a lot of argument, we all pooled in whatever little money we had and took the boy outside,” recalls Muthuraj. However, on Friday, February 1, Sachin and Manju somehow got information that the Sakleshpur Tahsildar was going to visit the kiln. They sent all 24 people in a tempo and left them in Krishnagiri after obtaining signatures from three members of the group. “We were dropped in Krishnagiri around 1 am on Saturday. Raju and Murali, all through the way, warned us not to reveal anything about our days in the kiln to anyone. They said that the paper which a few of us signed will anyway say that we were all treated well while in the kiln,” he says. Muthuraj now wants the district administration to intervene and help them get the benefits allotted for rescued bonded labourers. “We want to be safe in our native place so that Raju and Murali don’t come there and harass us,” he says. The Hassan district administration, however, refuses to acknowledge that the 24 people were bonded labourers. Speaking to TNM, a senior district official in Hassan, says that according to the inspection carried out by the Tahsildar, it has been concluded that the group was not treated as bonded labourers. TNM also accessed the report submitted by the officials who inspected the spot on February 1 stating that the workers were given freedom after their working hours and that the owners did not put any restrictions on them. The report also mentions that none of the workers were there in the kiln when the officers conducted the inspection. "In the spot visited by district officials, it was found that the workers were not confined to any room or area. They were also paid money," reads the inquiry report, adding that the no instance of violence or exploitation of the workers by the owners of the kiln came to the notice of the investigating officers. The official, however, states that the allegations levelled by the workers is that they have been made to work overtime. "Exploitation is a different thing, but bonded labour is a totally different thing. Bonded labour is for a long period of time. It cannot be for months or weeks,” the officer says. The Bonded Labour System (Abolition) Act, 1976 does not specify a time period for which a person must be working with his fundamental rights oppressed to be qualified as a bonded labourer. Prathima M, the Associate Director of International Justice Mission (IJM) affirms this. “The owners of the kiln and their agents have not allowed these people to move out or sell their skill elsewhere. This is a classic case of suppressing their freedom of movement, and hence qualifies as bonded labour,” she says. Prathima further states that these workers were not provided the minimum wages specified by the Karnataka government during their time at the brick kiln. “There has been no FIR registered against the brick owners or against the agents as far as we know. Only if they give the rescued people release certificates will these men and women get their eligible due from the government,” she adds. The group has filed a request with the State Human Rights Commission, Karnataka on Tuesday, seeking an intervention in the matter.